Rafi came to Bombay where he met Naushad who used his voice for Ek unhen mila and Tum Delhi main Aagrey in A.R. Kardar production Pehle Aap. Yahan badla wafa ka bewafayee ke siwa kya hai, a duet with Noorjehan from film Jugnu proved to be a turning point for him. Music lovers warmed up to Rafi’s numbers in film. Jin raton main neend ud jati hai kya kahar ki raten hoti hain from Raat Ki Rani underscored Rafi’s ability to deliver the best. 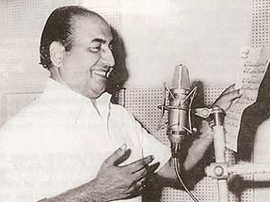 Baiju Bawara established Rafi’s credentials. O duniya ke rakhwale sun dard bhare mere naale and Man tadpat Hari darshan ko aaj were considered epitomes of perfection in singing. Rafi ability to depict every mood through his songs speaks volumes about the diversity of talent. Tasveer banata hoon teri khoon-e-jigar se from Diwana spelt class, while Phir wo bhuli si yaad aayi hai showcased Rafi’s vocal virtuosity. Over five decade have passed since these songs were recorded and yet none of his songs have lost their appeal. The composers for the day were thankful for a singer like Rafi. He could deliver whatever they wanted. He lent his voice to S.D. Burman’s ode to existential disillusionment, Yeh duniyan agar mil bhee jaye to kya hai in Pyasa. In Dekhi zamane ki yaari bichde sabhi bari bari from Kagaz Ke Phool, Rafi sang about love and loss. In Roshan’s Carvan guzar gaya ghubar dekhte rahey from Nai Umar ki Nai Fasal, Rafi brought out a lingering sense of loss and longing. Under the baton of N. Dutta, he conveyed the agony of a man whose dreams had been shattered in Main ne chaand aur sitaron ki tamanna ki thi from Chanderkanta. Nain lad jayi hein to manva maan kasak hoi be kari from the film Ganga Jamuna is still remembered for its exuberance. It was with Rafi’s voice that became the leitmotif for Shammi Kapoor’s famous "yahoo" exuberance in love songs. Numbers like Chahe koi mujhe junglee kahey, Bar bar dekno hazar baar dekho, Youn to humne lakh haseen dekhe hain, Ho gaya dil mera sooku sooku made Shammi the star he was.